This substation is right next to the local supermarket. I will see if I can get a closeup of the transformer identification plate without getting arrested, which clearly states 33kv/6.6kv No1. (I assume the transformer further away is No2, but I can't get close enough to see). I had assumed that everything round here was 11Kv, but it is one of the older parts of town, I shall have to either ask one of the PoCo crews working at the sub, or look at some of the smaller residential substations to see if the primaries are 6.6Kv. 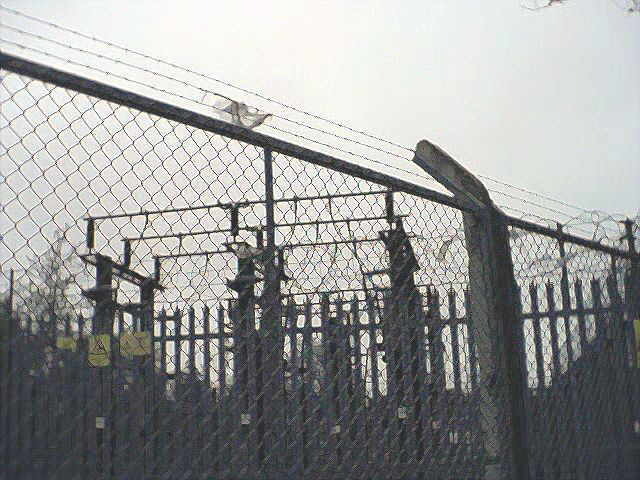 The second, and blurrier picture is the busbars apparently teeing off to another local substation. From memory, the 3 groups of cables are labelled (from left to right in the photo) Bitterne, which is the location of this substation; "Chilling" (which is the local 'main' sub, 132Kv if I recall correctly). It's also one of the interconnections from Fawley Power Station, but I think that switching is National grid, and it's just co-located; and Woolston, which is another local district. 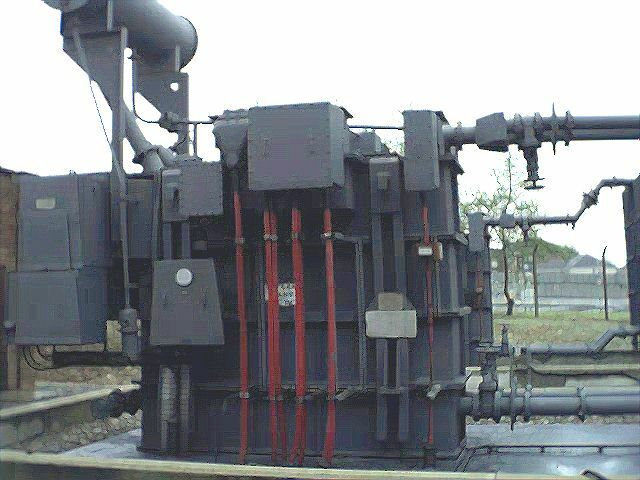 Can't say I've seen red conduit before or is that the cable sheathing going into the side of the transformer?. You can usually tell a 33kV transformer by the Oil Conservator tank above them. Having one of these trannies run dry is not a pretty sight. With respect to them Distribution busbars in the 2nd picture, we a whole heap of these in behind the Control room where the 66kV feeders come into town and are stepped down to local voltages. Looks like somone has left thier breeches on the barbed wire, trying to climb into the sub-station. Just a little note about that barbed wire section of the fence, wouldn't it be more effective to have the top section slanting outwards from the vertical part of the fence, instead of inwards?. It's cable sheathing, I think the colour is designed to warn people that 'this is not a water pipe' as many old PVC water pipes in the UK are black, and look scarily similar to HV cable, it's caused accidents more than once. I first saw this colour of sheathing in 1989 at school when they ran the overhead lines underground, although I'm not sure of the cable construction underneath. that would be amusing, but it's only a plastic grocery bag, from the store right next door. With regard to the fence, yes I would have thought it would make more sense to make it outward leaning, the only explanation I can come up with is that the fence is right at the property line, they may not have been allowed to make it overhang city land. Apologies for the picture quality, my camera isn't exactly 'modern', 640x480 is all it does. When I go to get more pics, I'll try to get the other side of the sub, which will show how surprisingly large the place is for a city area in the UK where land prices are ridiculous. I don't have a problem with the picture quality. Oddly enough there is a Woolston over here too, it's a suburb(?) of Christchurch, the most English city in the world, outside of England!. Can't say I've seen red conduit before or is that the cable sheathing going into the side of the transformer? You've seen this stuff in other photos just recently -- Take a closer look in the More Remote Control thread. Maybe they want to try to keep infiltrators inside long enough to catch them. Either that, or it's one of those dastardly detention areas for military use when the New World Order takes power!